Correction: An earlier version of this article incorrectly stated a missile had been placed on a long-range missile launch pad in North Korea, when reports actually indicated construction of a long-range rocket had been observed near Pyongyang and that upgrades to the Tonghang-ni launch pad had been upgraded. Satellite imagery revealed modifications to a long-range launch pad in North Korea have been completed and that construction of a long-range rocket had been observed at a weapons factory near Pyongyang, South Korean intelligence sources told Yonhap News Agency on Wednesday. The completion of an upgrade, an anonymous government source said, had been observed on the primary rocket launch pad at the Sohae Satellite Launching Station – also known as Tongchang-ni or Tonchang-dong – in Cholsan County, North Pyongan Province. 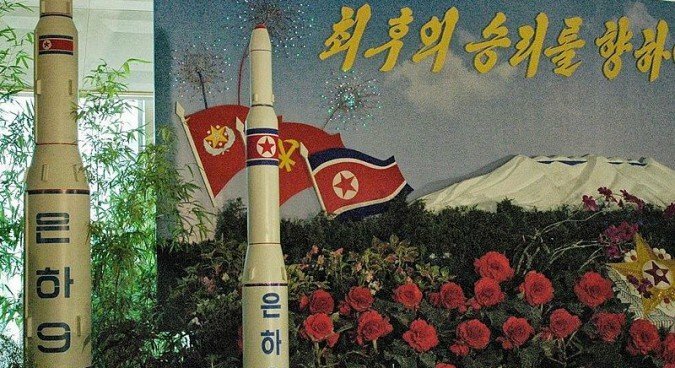 Furthermore, the source added it was thought North Korea would “carry out a provocation around the 70th anniversary of the founding of the Workers’ Party on Oct. 10,” Yonhap reported, referring to the possibility of a forthcoming long-range rocket launch. Bill Newcomb, former member of the UN Panel of Experts, previously said that another launch would result in more condemnation of Pyongyang by the international community. “If they (North Korea) have a missile launch, at a minimum I would expect a presidential statement condemning it, possibly they might append a designation of two or three to that statement,” Newcomb told NK News in June. The Tongchang-ni / Sohae site referenced by Yonhap is adjacent to the Korea Bay, part of the Yellow Sea (known in Korea as the West Sea) between Korea and China. The Sohae Satellite Launching Station was the site North Korea’s two previous launches of long-range rockets, both Unha-3 types, designated by Pyongyang as space launch vehicles for satellites. The first of the two Unha-3 launches was on April 13, 2012, and failed to put a satellite – the Kwangmyongsong-3 – into orbit. The second, on December 12, 2012, was successful in putting the Kwangmyongsong-3 Unit-2 satellite into orbit, albeit not a stable orbit. Since late 2013, North Korea has been working to improve and modify the Sohae Satellite Launching Station. Among the developments is an enlargement of the gantry on the launch pad from a height of about 50 meters t about 67 meters, allowing it to accommodate larger rockets than those previously launched from the site. The larger size likely means any future rocket launched will have a capable of achieving greater range than the Unha-3 and may also be able to carry a larger payload. North Korean rocket launches, though typically characterized by Pyongyang as being for the purpose of peaceful space exploration, are regularly criticized by the international community as tests of ballistic missiles, which are prohibited under numerous UN Security Council resolutions.